Available as an A5 blank greeting card, an A6 postcard, mini print and midi print. "Poppy Papavar Orientale" Original oil on canvas approximately 30" x 24" ready to hang with slip and frame £1,655. 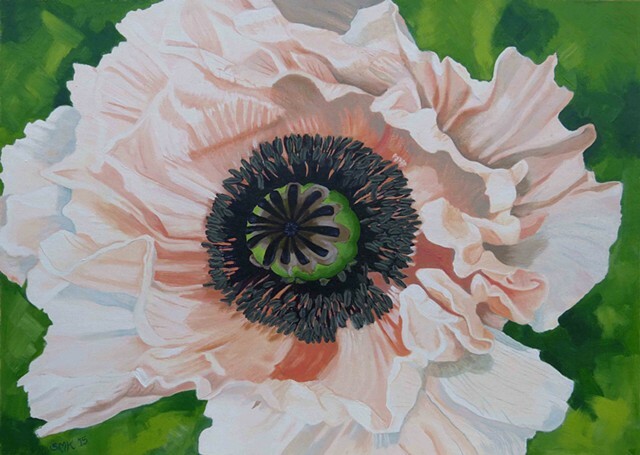 This beautiful peach poppy is from the gardens at Alnwick Castle. I took a photograph and worked this image from the photograph rather than from a drawing. It is full of lovely descriptive light, and promises new life as it unfurls.